When applications for our 2020 ACM40418 Certificate IV in Veterinary Nursing Perth course open in August 2019, we encourage you to read through the following information so you can prepare a successful application. Our On-campus course is highly competitive and our intake is limited to a small number of participants. With this in mind, it makes our qualification highly unique in that it is a very personalised course where our lecturers and support team get to know you and work closely with you to ensure your study journey is a success. We also hand select and organise a local veterinary practice to host your workplace practical training throughout the year. The course content is high level and intense, which is just one of the reasons why our graduates are highly sought after by industry. In fact, many of our graduates have paid jobs prior to graduation. With this said, now let’s get you prepared. To make a successful application, and be shortlisted for interview here are a few things you are going to need for your online application. If you don’t already have a USI number, you will need to apply for one. This is easy to do, just go to our USI page to find out more. We are also going to ask you about your previous working experience, whether that be an employed position or even volunteer work. If you have any proof of work experience or employment, make sure you have a digital copy on hand to upload, particularly if it is related to working with animals. Do you have experience that directly relates to this course? If so, you might be able to apply for RPL (Recognition of Prior Learning). RPL refers to both previous studies or completed qualifications, or on the job experience or volunteer work. If you wish to apply for Credit Transfers, make sure you have the unit codes and descriptions ready to input and a digital copy of your original certificates and Statement of Attainment to upload. 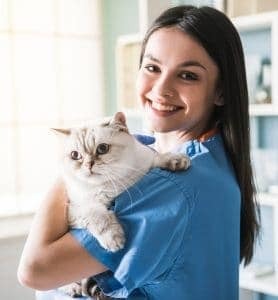 We are going to ask you why you want to study and work as a veterinary nurse. You will need to write at least 500 words telling us why you are applying and include any information about your past experience with animals. This is one of the most important parts of your application, so think carefully before submitting your statement. Have you met the pre-requisites? We’ll also be asking you quite a few other questions, but they are all pretty straight forward and easy to answer. In the meantime, if you have any questions feel free to drop us a line using our contact us form and we will get back to you. Applications for the 2020 On-campus, Full-time ACM40418 Certificate IV in Veterinary Nursing course will be open in August. Alternatively you can apply for our online eLearning course with a more flexible commencement date. Learn more HERE. Online elearning applications with a flexible start date, open all year round.